Want to use a bulletin board, but those basic ones in the office supply stores just don't seem like the answer? Here are some more interesting alternatives. 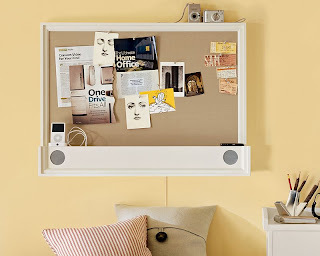 There are promoted as an item for a child's room, but they could look nice lots of other places, too. You can see the cheerful colors in the picture above. One drawback is that they may damage the wall when removed. Update on August 13, 2009: These are no longer on the Land of Nod web site. These boards are also meant to hang alone or in groups. 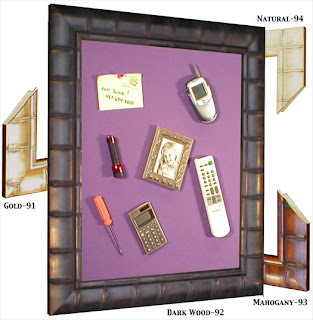 Magnets embedded in the sides of each frame allow multiple pieces to click together. Available in black, red, and silver. 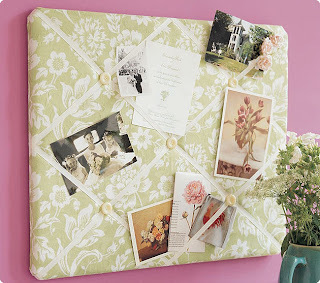 Not quite a bulletin board - you slip things into the ribbons that crisscross the boards. There are 41 fabric options - no solid colors, but a range of patterns. 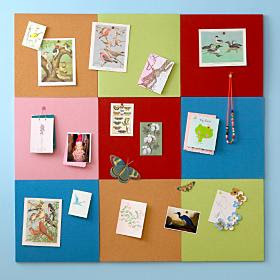 The same company also makes some nice-looking more basic cork boards, with four choices of frames. These are custom made, with a wide range of option for both the frames and the fabric colors. You can also look at the Shareboard Outlet for boards available at large discounts: ones with slight imperfections, or custom boards that got returned. Pick a state (in the United States), a country, a region - or the whole world! There's also this antiquarian map. This board lets you plug in your MP3 player and store it in the recessed area, and then play music using the pair of built-in speakers. December 2008 update: This board doesn't seem to be available any more, although Pottery Barn does have other linen pinboards. Thanks for the attractive suggestions. On consulting gigs I always pay attention to stuff on walls, esp. bulletin boards and white boards. Do you have some guidelines for what's OK to *put* on these? Matthew, as with so many things in organizing, it depends on the individual. This blog post resulted from the research I did for a client who is going to use her board for her phone list and for the papers related to her urgent do-it-NOW projects. 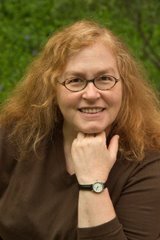 Cynthia Friedlob said she uses a bulletin board for the 3x5 cards that make up her to-do list. And others use the boards for inspirational quotes and pictures. The one guideline I would strongly recommend would be a regular review - weekly might be good - to ensure that everything on the board still belongs there, and that nothing critical is missing.